Leadership and The Church is a church administration seminar being held on Saturday, September 22 at Hannibal-LaGrange University for local church leaders. In a world facing a new church scandal almost daily, there has never been a better time to increase awareness and knowledge in this crucial area of church administration. 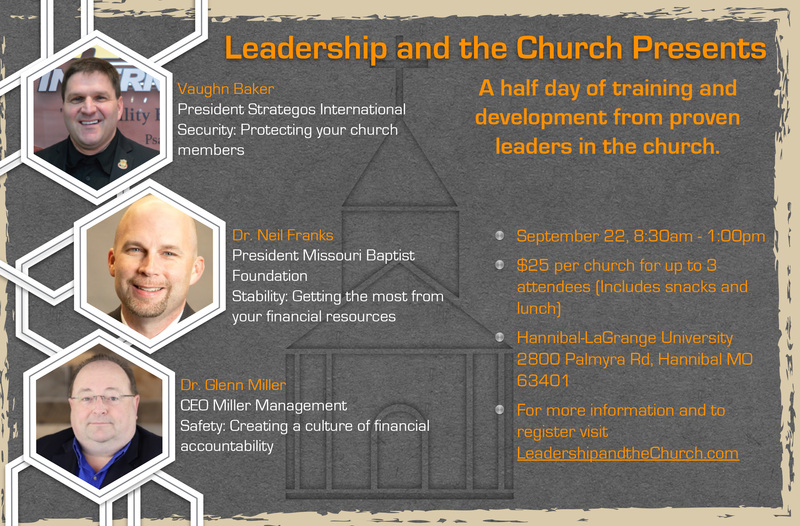 Pastors, elders, treasurers, staff members, and volunteer leaders are invited to learn about three issues facing churches today: security, safety, and stability. Miller Management is a public accounting firm that exclusively serves churches and nonprofits. Since our beginning in 1989, we have worked diligently to bring unparalleled value to our clients. We define value as providing well-designed, professional, user-friendly accounting and administrative products and services. Our services increase organizational effectiveness, while at the same time reducing administrative costs. Find more information about how Miller Management is serving ministries at https://GoodFaithAccounting.com.